Playing fetch with your dog is one of those fun little things in life. For you, it’s nice to bond with your dog, for them, it’s exercise and a whole heap of fun. But what do you do if you don’t have a dog to play fetch with? This cow playing fetch proves it’s not just for dogs. Yes, we have genuinely found a video of a cow playing fetch and it’s so darn cute! We’ve never seen a cow look so energetic and joyous. Jasmine Fenah Sjögren loves playing fetch with her adorable cow Lotta. The two live on a farm near Gothenburg, Sweden. She likes to keep her cow companion active and happy. Lotta loves chasing a gym ball that Jasmine throws and kicks to her. Then, as a dog would, she gets it and brings it back to her owner. Jasmine shared a video of her and her cow playing fetch on Facebook, where the video went viral. Lotta the cow playing fetch is the cutest video you will see today! 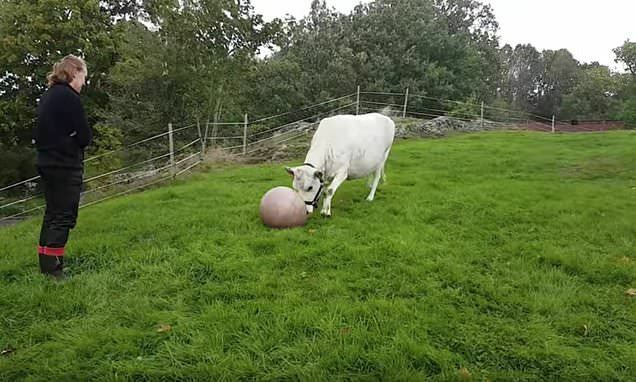 Lotta got her ball three years ago when she was a little stressed… because we did not have calves. Since then, it has been with her. The heartwarming clip is guaranteed to bring a smile to your eye as you watch this jolly cow run around the pastures chasing her gym ball. She goes up and down the hill to retrieve it and bring it back to her owner. This certainly is one well-exercised creature. I don’t know about you, but after watching this bovine beauty run merrily through the field I can’t help but want a pet cow myself. Lotta got the ball three years ago when she started suffering from anxiety because she didn’t have any calves. But the ball brought her joy, it’s her favorite toy and she doesn’t like being without it.